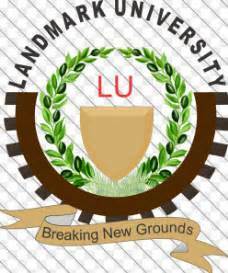 2017/2018 Admission form into full time Degree Programmes Of Landmark University Post Utme form, cut off mark, courses, fees now out. Applications are hereby invited from suitably qualified candidates for admission into full-time degree programmes in the following Colleges and Programmes of the University. The minimum entry requirements for admission into Landmark University are credit passes in 5 subjects at the SSCE/GCE 0′ Level/NECO/NABTEB or its equivalent obtained at not more than two sittings. The subjects passed must include English Language, Mathematics and other subjects relevant to the proposed course of study. Candidates are also to note that, there are other requirements that may be specific to a College and/or a Programme. Candidates must have sat for the current year (2017) Unified Tertiary Matriculation Examination (UTME) of the Joint Admissions and Matriculation Board (JAMB) and attained the prescribed cut-off marks as a statutory requirement for entry into Nigerian Universities. Interested candidates must have credit level passes in English Language, Mathematics, Chemistry, Biology or Agricultural Science with a pass in Physics. Credit level pass in Agricultural Science must be backed with at least a pass in Biology. Interested candidates must have credit level passes in English Language, Mathematics, Physics, Chemistry & one other science subject (selected from Further Mathematics, Biology, Fisheries, Agricultural Science, Technical Drawing and any other recognized Science subject). 1. B.Sc (Computer Science) 4 years Physics, Chemistry and Biology/Agricultural Science. 5.B.Sc (Mathematics) – 4years Physics any other two science subjects or one science and one Social science. 6. B.Sc (Physics) – 4years Physics, Chemistry and any other relevant Science subject. Visit our admission application portal via http://admission.lmu.edu.ng to complete the application payment form. Complete the application payment form with the necessary and accurate details. Please note that your UTME registration number, a valid email address and GSM number will be required. After completing and submitting the application payment form, a preview of the application will be displayed. Verify its authenticity and correctness, then click on “Pay” button to make payment. You will be redirected to the payment page where you are expected to make payment of N5, 000 application along with a processing charge depending on the payment channel selected. Please note that you will need an ATM Card (Verve, Visa, MasterCard or E-Tranzact Card) to complete your payment. After completing the payment, you will be redirected back to our admission portal and a message and SMS containing your login credential and further details will be forwarded to the supplied email address and phone number respectively. The screening will be computer based and will take place at Landmark University, Omu-Aran, Kwara State. Landmark University does not have any agent or representative to process the admission. The use of such agent is at candidate’s own risk and they should desist from using third party in processing their applications. R e c o g n i z e s o n I y: w w w. I m u. e d u . n g and www.admission.lmu.edu.ng as her official websites.